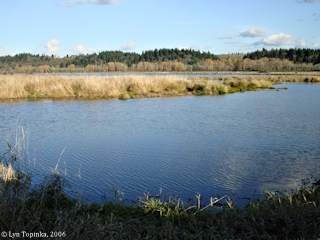 Click image to enlarge Hathaway Lake ("Fales Lake", "Rest Lake"), Ridgefield National Wildlife Refuge, Washington. Image taken, November 25, 2006. Today's Hathaway Lake ("Rest Lake") was once known as "Fales Lake". 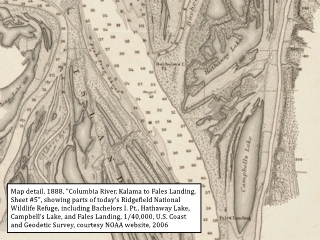 Fales Landing is an old landing site located along the Washington shore of the Columbia River at River Mile (RM) 94, across the river from and slightly downstream of Willow Point, Sauvie Island, Oregon. 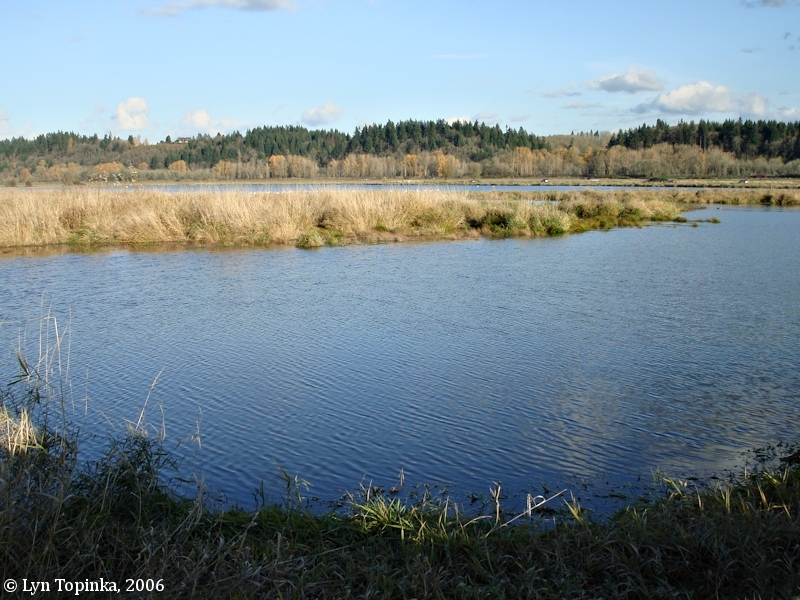 To the east of the Fales Landing location is Campbell Lake, now a part of the Ridgefield National Wildlife Refuge. 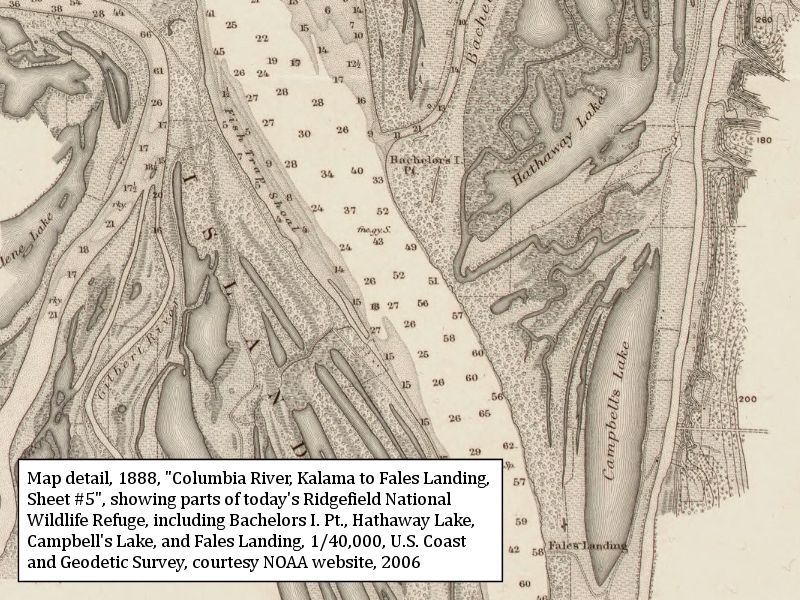 South (upstream) of Fales Landing is Knapp Point and Knapp Landing, and Post Office Lake, the location of Lewis and Clark's campsite of November 4, 1805. "Fales Landing: David R. Fales, who had a land claim just south of what is today the Ridgefield Wildlife Preserve, was born in Maine in 1807 and worked as a river boatman in the east. He started the journey west at the age of 45, arriving in The Dalles in 1852. Everything that he owned, through bad weather and theft, was lost to him. He came onto the claim in Clark County in 1854, put his family in an old pole house there, and set to work. He built a house on the bluff sturdy enough to be used as a refuge during the Indian Wars of 1855-56. He was elected to the Territorial council in 1858 and lived out the rest of his life as an honored and beloved member of the community. He died on the 4th of July 1885. 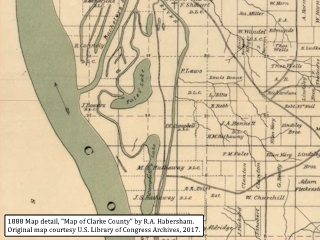 The Clark County Plat map of 1888, found on "Rootsweb.com", has today's Rest Lake, located on the River "S" Unit of the Ridgefield National Wildlife Refuge, labeled as "Fales Lake". The U.S. Bureau of Land Management's General Land Office (GLO) Records website (2011) lists David R. Fales and Sarah Ann Fales being granted title to 320.42 acres of T3N R1E, Section 6, and T3N R1W, Section 1, on December 22, 1865 (1850 Oregon-Donation Act). David R. Fales also aquired titles to land in 1866, 1867, 1871, and 1872. "Fale's Landing" was found mentioned in "The Daily Astorian" on January 18, 1881. 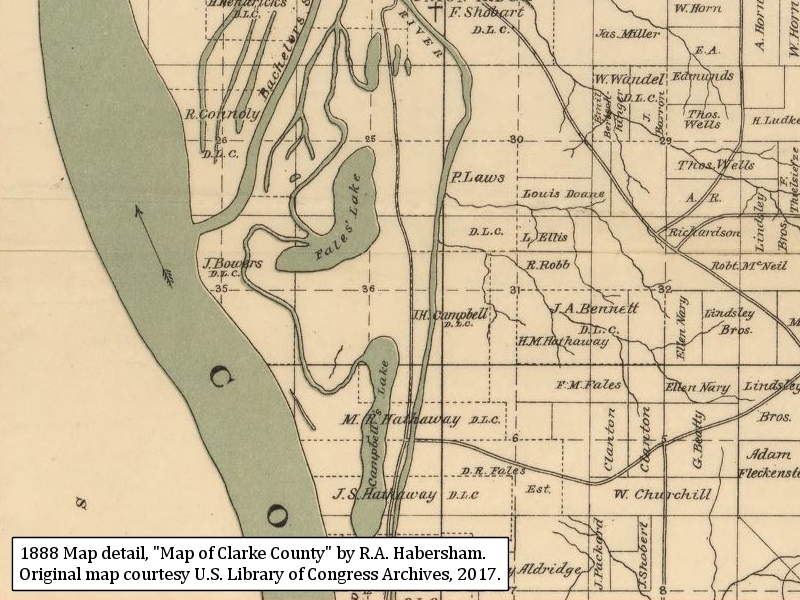 Click image to enlarge 1888 Map detail, "Map of Clarke County" by R.A. Habersham, showing "Fales Lake". Today's "Hathaway/Rest Lake", Ridgefield National Wildlife Refuge, Ridgefield, Washington. Original Map courtesy U.S. Library of Congress Archives, downloaded 2017. San Francisco Liner Cuts Log Boom in Twain in River. "ASTORIA. Or., Feb.1 -- (Special.) -- The steamer Columbia which was due here from Portland at an early hour this morning, was delayed by the heavy fog and did not arrive until 4 o'clock this afternoon. When rounding the bend at Swan Island about 9:30 last evening the Columbia met a log raft in tow. Pilot Snow says it was a case of either running the Columbia ashore or striking the raft, so he headed for the raft. The collision broke the boom sticks and sent many of the logs adrift, but the steamer was not injured. On arriving at Fales Landing about 11 o'clock the fog was so thick that the Columbia was anchored and remained there until 11 o'clock this morning before getting under way again." Source: "Morning Oregonian", February 2, 1906, Historic Oregon Newspaper Archives, University of Oregon Libraries, 2016. Fales Property Taken Over by M. Ritter for $39,000. "VANCOUVER, Wash., Aug. 6. -- (Special.) -- The ranch comprising more than 700 acres, known as the Fales property and belonging to Mrs. Virginia Fales, was sold by her agent, P.M. Elwell, today to M. Ritter, of Portland, for $39,000. The new owner will at once improve the property, stock it with fine cattle and establish a large dairy. The ranch adjoins the Bellinger ranch, which recently sold for $40,000. The original owner, David R. Fales, willed the place to his son, Francis M. Fales, in 1885. The son died in 1901, leaving the land to his widow, Virginia Fales. R.M. Davis has had the land leased for several years." Source: "Morning Oregonian", August 7, 1913, Historic Oregon Newspaper Archives, University of Oregon Libraries, 2016. According to the 1899 "Lights and Fog Signals of the United States" (1899, Government Printing Office) the Fales Landing Post Light was a fixed white light suspended from an arm on a stake at Fales Landing, Washington, on the easterly side of the river. The light was established in 1898. Washington -- Fales Landing Light, page 36, No.152 (List of Lights, Buoys and Daymarks, Pacirif Coast, 1907, page 66): Located close to the bank on the easterly side of the Columbia River, and in the county road at Fales Landing. November 9 this fixed white post-lantern light was moved about 400 feet southeast by south of its former position, without other change." Source: "Morning Oregonian", November 18, 1907, Historic Oregon Newspaper Archives, University of Oregon Libraries, 2016.